After a lengthy absence from the grandest stage in all of professional wrestling, 2017 saw the return of The Hardy Boyz, Matt & Jeff Hardy, to a WWE ring. One of the most accomplished and innovative tag teams in WWE history, the Hardyz paved the way for a faster paced, high intensity (and high risk) daredevil style which changed the face of tag team wrestling within the WWE. 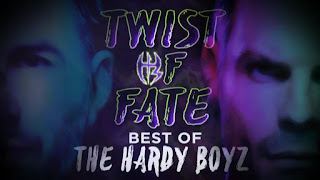 After returning to great acclaim at WrestleMania 33 and winning the WWE RAW Tag Team Titles, WWE have set out to mark Matt and Jeff's homecoming with this 3-disc DVD set 'Twist of Fate: The Best of the Hardy Boyz' featuring over 25 matches and newly recorded interview segments at the Hardy Compound that add some context and behind-the-scenes information to the storied careers on display. The first disc begins, where else, with the WWE debut of Matt and Jeff as a tag team from way back in 1996. Facing off against the short-lived duo of The New Rockers (Marty Jannetty and Leif Cassidy, AKA Al Snow), the young Hardy brothers acquit themselves well while taking a resounding beating. Jeff takes a huge back body drop over the ropes and to the floor, before suffering a doomsday powerbomb to give the Rockers the victory. Fast forward a couple of years and The Hardy Brothers (now both out of high school and able to compete full-time with the WWE) have become The Hardy Boyz, but are still in search of victory as they take on the Kai En Tai team of Funaki & MEN's Teioh. The Hardyz get to display some innovative offense, but their risk taking is almost their undoing as Jeff misses a step-up tope and crashes hard to the floor. But when Kai En Tai's nefarious tactics backfire on them, the young Hardyz take full advantage and pick up their first WWE win in the process. Their first taste of WWE Tag Team gold came in 1999 against The Acolytes of Bradshaw & Farooq. With the help of Michael Hayes as their manager The Hardy Boyz steal a win over their intimidating opponents, thanks to a tombstone on the ring steps Kane delivered to Bradshaw the night before, and a shot to the head from Hayes' cane. Next we're treated to two of the earliest matches in the long-standing rivalry of The Hardy Boyz and Edge & Christian. The first of the two is a fast-paced Tornado Tag match from an episode of Smackdown, while the second is the very first (but most certainly not last) ladder match in which both teams faced off against one another. Here we get a glimpse of the inventiveness of The Hardyz and Edge & Christian, the chemistry they had together in the ring and the death-defying lengths they would go to in order to steal the show. Next up is another big first, the first time The Hardy Boyz wrestled each other on WWE television. Forced into the match by Stephanie McMahon, the reluctant Hardyz soon find their competitive spirit and the result is a brief but entertaining singles bout pitting brother against brother. Another tag match vs Edge & Christian follows, this one from No Way Out 2000 is a bit more grounded than the last and notable for The Hardyz manager Terri turning on them. The year from WrestleMania 2000 to WrestleMania X-Seven was an important one for The Hardy Boyz and the first disc of the set closes out with four huge bouts that went a long way to cementing their status as one of the most exciting tag teams in the world. First, the 3-way ladder match from WM 2000 introduced the destructive Dudley Boyz to the Hardyz/E&C mix, while SummerSlam a few months latter saw all three teams collide again in the first ever TLC match. At Unforgiven Edge & Christian faced the Hardyz in a memorable cage match, while WM X-7 saw the three-way TLC match return for a second year. These four matches include some of the most memorable moments in the careers of all six men involved, and set the bar for tag team wrestling in the WWE. 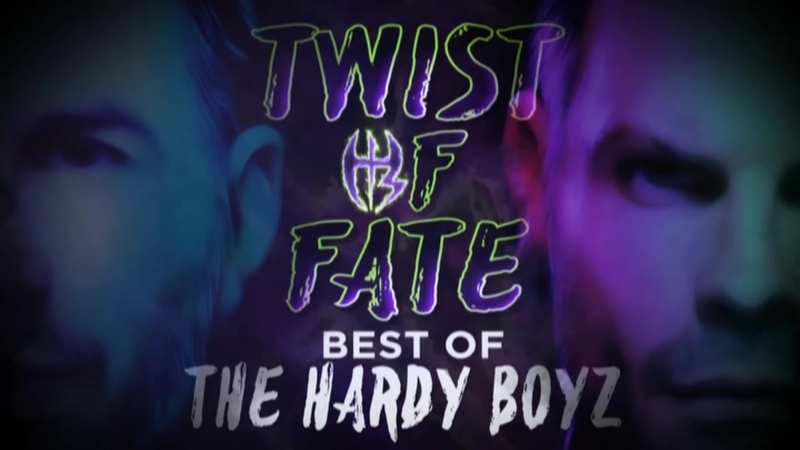 Disc 2 begins with The Hardy Boyz at the very top of the tag team game, having seen it all and done it all as a tag team their increasing popularity grants more and more opportunities for them outside of the tag division and in the main event. Case in point, a huge Monday Night RAW main event match pitting The Hardy Boyz & The Brothers of Destruction vs Stone Cold, Triple H, Edge & Christian. Matt & Jeff talk about what it meant to them to get to work with some of the biggest names in the WWE and how they used the experience to improve their game. Next, old enemy Edge teams with The Hardyz to take on Test & The Dudleys, setting up a unification match between The Hardyz & The Dudleys for the WWF & WCW Tag Team Titles in a steel cage at Survivor Series 2001 that saw a memorable (but disastrous) Swanton Bomb off the cage. Over the next year or so Matt & Jeff would branch out more as singles competitors with varying degrees of success. While Matt established himself with his Version 1.0 character, Jeff struggled to find his footing on his own and would end up leaving the WWE in 2003. The matches chosen here reflect that, with Chris Jericho taking on a Jeff Hardy struggling to find his identity in the "solo dimension", as Jeff puts it, and two great matches from a popular feud between Matt Hardy and Rey Mysterio for the Cruiserweight Title. The second of which is an important match in the career of Mysterio, his first singles title in the WWE. Fast forward to December 2006 and the Hardy Boyz are once again teaming together in a WWE ring for the first time in just under 3 years. The match vs MNM is a bit of a mixed bag, although it drags in places and goes longer than necessary it was the one bright spot of a generally ill-remembered ECWWE PPV, but the crowd were definitely pleased to see The Hardy Boyz teaming again. Next up a solid tag bout pitting the newly minted WWE Tag Team Champions (The Hardys won the belts in a Battle Royale on RAW) against Lance Cade and Trevor Murdoch, notable for being the first Hardy defence of the tag titles in six years. The final match on this portion of the set is a show-stealing ladder match from One Night Stand 2007 that saw The Hardy Boyz defend the World Tag Titles against The World's Greatest Tag Team of Charlie Haas and Shelton Benjamin. A classic car crash of a bout that illustrates how well matches these two teams were, and what a shame it is they didn't face off again. Shelton has the athleticism and will to put his body on the line like Jeff, Charlie has the skills to handle Matt in the ring, but The Hardys have the experience and the result is a great tag contest that is deservedly highlighted here. Disc 3 picks up the action in 2009 with the Hardy brothers locked in an embittered feud stemming from Matt's jealousy of Jeff's popularity, and resulting in a memorable storyline where it's revealed Matt burned down Jeff's house (a real life event incorporated into the tale). They face off in a ladder match at WrestleMania XXV that sees both brothers test the extremes to which they'll go in order to gain victory, before the feud is settled at Backlash 2009 in an I Quit match where Jeff finally defeats his brother. A few months later Jeff would again leave the WWE, and a year after that Matt followed him. They reunited in TNA and ROH, a period of their career covered here by a ten minute interview segment and a few scant clips courtesy of the Global Wrestling Network. Quickly, however, the set races towards The Hardy Boyz big return to the WWE at WrestleMania 33 in Florida. Fresh off a gruelling ladder match to finish up their time in Ring of Honor, Matt & Jeff were brought back to the WWE in the utmost secrecy and, although their return had been widely speculated upon, the response from the crowd was no less rapturous. The match itself is a chaotic 4-way ladder match for the RAW Tag Team Championship, pitting The Hardy Boyz against Sheamus & Cesaro, Enzo & Big Cass and Luke Gallows & Karl Anderson. While much of the action inevitably revolves around the other teams in the match, the experience of the Hardyz pays off and they pick their moment perfectly to win the tag titles (as well as reminding everyone that they're still as crazy as ever, Matt with a Twist of Fate off a ladder, and Jeff hitting an insane Swanton to the outside). The next two matches on the set come from The Hardy Boyz feud with Cesaro & Sheamus over the RAW Tag Team Championship, namely the cage match from Extreme Rules 2017 and the Iron Man Tag Team Match from WWE's Great Balls of Fire PPV. The name of the show being 'Extreme Rules' only highlights how different the modern WWE cage match is from the sort of cage matches Matt & Jeff were innovating nearly two decades prior. That being said, all four guys work hard in this one, as they do in the Iron Man match. Not a rule-set terribly suited to tag wrestling, but they make it work here and after a bit of a rough start the crowd get really into the final third of the match. Rounding out the set are two singles matches from Monday Night RAW with the Hardy brother in turn trying to wrest the WWE Intercontinental Title away from the hands of The Miz. Compared to the other singles matches on the set these show a different side of the Hardyz, older, a bit wiser and more experienced, but still with a spark of that same energy they possessed when the were in their prime. Afterwards Matt talks about Jeff's recent injury and how that gave him an opportunity to bring his 'Woken' character to the WWE, before the brothers contemplate what the future will bring for their careers to bring the interview to a close. Overall this is a content-rich set that will please any fan of The Hardy Boyz. While not a definitive collection, the matches have been selected to tell the story of Matt & Jeff's careers from the beginning up to the present day and, to that end, the selection suceeds with only a small number of matches feeling superfluous. The interviews are a welcome addition and provide good context where needed as well as a number of backstage anecdotes, and it was cool to see early footage of the Hardyz as kids and some clips of their time in TNA.